Hike, raft, ride and more on a Utah adventure vacation. 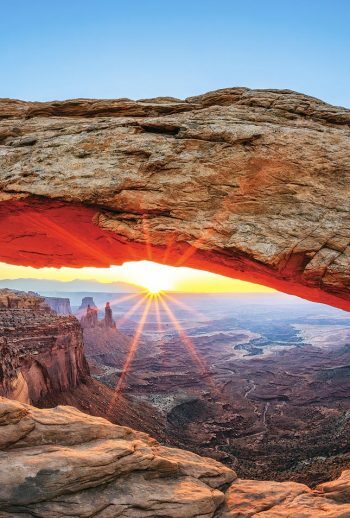 Discover some of the country’s most unique and stunning geological features on a Utah adventure vacation with Austin Adventures. Hike the world-renowned trail to Angel’s Landing in Zion National Park. 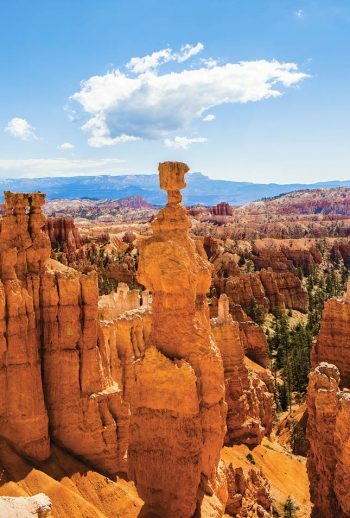 Explore the famous hoodoos and hanging gardens of Bryce Canyon National Park. Get wet when you raft the famous waters of the Colorado River. Experience a Hummer ride through the awesome Slick Rocks of Canyonlands National Park. Take in the jaw-dropping views of the iconic Delicate Arch in Arches National Park. They call it “The Grand Circle” – and for good reason. From Arches to Canyonlands, Bryce Canyon to Zion, uncover this unbelievable concentration of National Parks with Austin Adventures, the experts in adventure travel. WHEN IS THE BEST TIME TO TRAVEL TO UTAH? Utah has one of the most varied terrains in all of the United States. The same can be said for Utah’s weather. Some of the mountains can receive over 500 inches of snow in the winter, in the summer parts of the state can reach a 100°F and spring and fall will bring every type of weather imaginable. They have a saying in Utah: “If you don’t like the weather, wait five minutes”! We will definitely wait, as Utah’s National Parks have some of the most unique features to offer: Hoodoo formations in Bryce Canyon National, The Narrow’s Hike in the Virgin River Slot Canyon in Zion National Park, Island in the Sky Mesa in Canyonlands National Park, and Delicate Arch in Arches National Park! Utah’s temperatures vary greatly depending on the area that you are traveling to. This time of year tends to be the most unpredictable. Wet and windy one day, sunny and calm the next day. The desert areas will be the greenest during the spring. May is a great time to visit the National Park’s in the state as the average day time temperate is 82-86°F! Summer you will find the need for the most sunscreen! Temperatures range from day time of upward 100°F in July/August and a low of 66°F in July/August in the evening so you will still need to plan to bring along a light jacket. Ah, the cooler temperatures start to return. Day time highs are a comfortable 75-80°F during the day in September and October, but you should definitely pack a jacket, hat, and glove for the evening temperatures of 45-55°F. You can encounter light snowfall in the higher parks like Bryce Canyon National Park in late September during this time of year. Winter snowfall provides excellent skiing and adds a new beauty to the already gorgeous landscape. The average daily temperature will range around 34°F if you are looking to do some skiing or 55°F if you are hanging out in St George, Utah. In a desert environment, the summer months can be hot and dry with temperatures in the summer months (July and August) at100°F, so it is essential to drink plenty of water. You will be provided with a water bottle on any Austin Adventures that holds up to 25 ounces of water. There are several filling stations located throughout the parks to ensure that your bottle stays full and of course, your adventure guide always has extra water on hand to ensure everyone is hydrated. Anytime you are in Utah you should plan to dress in layers. The elevation can change from 2860 feet in St. George, Utah to 9115 feet at Rainbow Point in Bryce Canyon National Park which is only about a 2-hour drive north. We recommend conversion pants (pants that zip off into shorts when you need), and long sleeve outer layer with a short sleeve layer underneath. A hat with a brim is also an essential item to bring along or bandanna to cover your neck/head from the sun. Sunscreen is very important whenever you are enjoying the outdoors. Utah boasts upwards of 300 days of sunshine each year, and the ultraviolet rays from the sun will burn you stronger at higher elevations, so we want to stay extra protected. SPF 30 or higher “broad-spectrum” provides protection from both ultraviolet A and B rays. Re-apply approximately every two hours or as indicated on the label. When it comes to travel tips, sharing is caring, so we’re happy to pass on a few pointers on how you can best experience Utah. Utah is called The Beehive State. The nickname comes from members of The Church of Jesus Christ of Latter-day Saints, or Mormons, who first settled in the territory. “Deseret,” in The Book of Mormon is a honeybee. Early Mormon settlers have been described as having carried “swarms of bee” with them. This nickname commemorates the industry of the people of Utah. Utah’s annual rainfall varies greatly from less than five inches in Utah’s arid Great Salt Lake Desert to more than 60 inches in the northern mountain ranges. Utah is a landscape photographer’s paradise. You have the sandstone arches, tall pillar hoodoos, spires, towers, slot canyons, river gorges, canyon walls and shadows, silky water moving through carved and rusted canyons, weeping rocks, green forest, etc. It truly is a photographer’s dream!